It doesn’t cross Mr Wright’s mind that the annoyance could be due the fact that there is no real sign that “pledge that the big five would gradually get rid of all their nukes” will ever be redeemed. This is typical of what some Indian commentators term “non-proliferation ayatollahs” (why insult ayatollahs?). So steeped is their sense of entitlement to nuclear weapons, so complete is their rewriting of nuclear history, that the NPT is presented merely as an instrument to keep nuclear weapons out of the hands of everyone but the United States, Russia, China, Britain and France. The reality that it represents a bargain—disarmament (by the five countries that had tested nuclear weapons before 1969) for non-development of nuclear weapons (by the rest)—is distorted into a discourse over who can ‘legitimately’ have nuclear weapons. Mr Wright goes on. North Korea, he writes “having dropped out of the treaty around the time it got a nuke, has the same status in international law as India, Pakistan and Israel.” This is not only smugness and ignorance. It is a failure to apply elementary logic. There is a huge difference in international law between a countries that have willfully violated a treaty it has signed—North Korea and Iran—and a country that have not signed the treaty at all. Anthropomorphic analogies are best avoided while discussing international relations, but this one makes sense: It is absurd to accuse an unmarried person of adultery. Mr Wright might argue that his point was that he meant that North Korea was a sovereign state, just like India, Pakistan and Israel. In which case, he should know, that so is the United States. If his point is that the United States shouldn’t discriminate between allies and non-allies when it comes to accepting their ownership of nuclear weapons, then he should answer just why the United States should accept its own nuclear status. If all this stinks of hypocrisy, it is because that’s what it is. Realists will have no problems with that—in the amoral world of international relations, discriminatory behaviour in the pursuit of self-interest is par for the course. But in that tragically amusing world of US politics, ‘liberals’ like Mr Wright will argue that it is only the conservatives that do the hypocrisy thing. That is hypocrisy. NB: The NPT is bunk. If those genuinely concerned about nuclear disarmament don’t think different, like in this modest proposal, just be ready for more blows like the one China is set to deliver. As brazen has China’s attitude towards nuclear proliferation continues to be, it is nevertheless good to see Beijing openly reveal why it is abetting Pakistan’s fissile material factory. It’s not about nuclear energy. It’s about nuclear weapons. For if you have “compelling political reasons concerning the stability of South Asia” helping Pakistan build more electricity generation plants is not what you would do. The incredulous attempt to claim that its new reactor sales are actually part of a deal it signed with Pakistan before accepting NSG obligations appears to have been discarded. China’s brazenness is supposedly due to the fact that the United States needs its support at the United Nations Security Council to place sanctions against Iran. In other words, Beijing is counting on President Obama being okay with the certainty of allowing an unstable, adventurous, military-ruled Pakistan to build more nuclear weapons as the price of the possibility of preventing Iran from building one. And more importantly, just what does is the “immediate resolution” that Prince Saud al-Faisal called for? As Dan Drezner suggests (linkthanks Pragmatic Euphony) these could only mean a deniable nod for preventive air strikes by Israel or a signal that Riyadh will activate its contingency plan for its own nuclear deterrent. So what could this be about? The answer, in all likelihood, is that Saudi Arabia just passed the buck. In the event this is about encouraging the United States and Israel to exercise the military option against Iran’s nuclear facilities, Saudi Arabia benefits to the extent its regional rival suffers while it is the United States and Israel that will attract Muslim anger across the world. If, on the other hand, the United States & Israel—wisely—do not use force against Iran, Riyadh can blame Washington for being unable to prevent Iran’s nuclearisation and exercise its options to procure its own deterrent. Iran is unlikely to attack Saudi Arabia with nuclear weapons anyway, leaving Israel as the net loser. Like India, Israel will have to contend with “jihad under the protection of a nuclear umbrella”. Either way, Saudi Arabia wins. In contrast, if it indeed had backed sanctions against Iran, it would have to do its share of the dirty work of having to persuade China to stop protecting Iran. Beijing would extract a price for its acquiescence equal to, if not exceeding the loss to its commercial interests in Iran, which Riyadh would have to substantially bear. In the end, all these costs would come to nought, because sanctions are unlikely to stop Iran from acquiring nuclear weapons. In the unlikely event that sanctions do work, the outcome would effectively be one where Saudi Arabia would have paid for Israel’s security. It’s not hard to see why the Saudis didn’t back sanctions. What happens next? It’s unlikely that Riyadh will be satisfied with a US nuclear umbrella even if it were offered by Washington. If Iran proceeds with its plans to build a nuclear weapon, we will discover who Pakistan was making all that fissile material for. Why should New Delhi be furious when Mr Clinton’s words show that Indian officials ensured that the psychological aspect of nuclear deterrence was maintained during the crisis? For a country with a no-first use policy, it is imperative that there is no ambiguity in the minds of adversaries and observers with regard to its commitment to a retaliatory strike. If Mr Clinton was convinced that the red button would be pressed in retaliation, regardless—and perhaps more importantly, in spite of knowledge of the damage assessments—New Delhi should be pleased. Given his subsequent actions, this might have well been the case. It is unclear who made these statements to the Clinton administration—whether they were made by government officials or by interlocutors outside the government. Also, the damage assessment of 300 to 500 million Indian casualties appears overstated (given the state of Pakistan’s arsenal in 1999, at least)—it is unclear if this was a case of Indian officials deliberately overstating it to signal how much damage India was willing to accept; or indeed, a case of Mr Clinton exaggerating the numbers to show how abominable the Indian position was. (See an earlier post on MUD or mutually unacceptable destruction). The paradox of nuclear deterrence requires India to credibly demonstrate the unflinching resolve to cause mindless destruction in order to forestall it. To see this as playing “fast and loose” to notch a “bizarre win” is an uninformed, superficial and incorrect way to look at this issue. In fact, these revelations highlight an important aspect germane to the current public discussion over the minimum credible deterrent. Much of it revolves around the adequacy of the nuclear arsenal—despite broad consensus that the garden-variety 20kT fission warheads are deployed on multiple platforms. The crucial question is: can Indian officials continue to convince the Clintons of the world, like they did in 1999? The business of convincing cannot be left to serendipity—it must be institutionalised. At the sidelines of a G-20 summit, two bhais, one Hindi, one Chini, meet at an abandoned temple. Contrary to popular belief, the Indian interlocutor was not making a emotional argument. 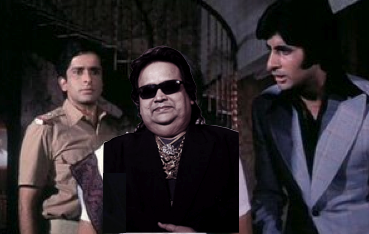 He was engaged in strategic signaling—sounding a subtle warning that even if the thermonuclear design didn’t deliver the expected bang, we have Bappi on our side. A keen scholar of Indian history and culture, the Indian diplomat was drawing attention to the ancient Reality Show in which the Kauravas might well have had the biggest army, but the Pandavas had The Charioteer. We all know how that war ended. First, because a thermonuclear bomb has to be developed indigenously it is very hard and expensive to build one. On the other hand, not only do we already have Bappida, but he himself has never been moved by indigenousness, swadeshi and other forms of irrelevant parochialism. He’ll take whatever, from wherever and make it rock. Second, even if you design a thermonuclear bomb, it is very difficult and very costly to test it. Bappida doesn’t suffer from similar constraints. He’ll just go ahead and test his designs—if you think it is successful, you’ll get on your feet and dance. If you don’t, then it cost you Rs 25 (in 1985 rupees) or less to figure out that you are on the sad side of the generation gap. No one will demand a ban on his tests. Fourth, you can’t put dark glasses on a thermonuclear bomb. Fifth, a thermonuclear bomb is useless as a store of wealth. But Bappida is India’s secret Sovereign Wealth Fund. All that gold jewelry can defend the rupee, the Indian government and the Indian film industry. Sixth, the bomb doesn’t have a son called Bappa. Seventh, nobody in Kazakhstan, Tajikistan, Hollywood or South Bombay knows, or gives a damn about, India’s thermonuclear bomb. But they are passionate about Jimmy. Eighth, try getting a thermonuclear bomb to sue Dr Dre for plagiarism. It can’t, and even if it did, no California jury will side with an ugly beast that doesn’t sport dark glasses indoors and wear heavy gold jewelry. Ninth, a hydrogen bomb can’t judge a reality show. Actually, astute as they are, the Chinibhais have known all this for some time. But they couldn’t do much about it. Not that they didn’t try—surely, you don’t think that it is a mere coincidence that that Dear Leader chap wears dark glasses—but not every charioteer is The Charioteer. Till that time, India is safe. It’s not so much about bigger bombs. It’s about improving command & control. In an op-ed in The Hindu today, K Santhanam & Ashok Parthasarathi make a compelling case that the thermonuclear bomb tested in May 1998 at Pokhran was not only fizzled, but “actually failed”. They also go on to conclude that “no country having undertaken only two weapon related tests of which the core (thermonuclear) device failed, can claim to have a (CMD or credible minimum deterrence).” They arrive at this assessment despite observing that “the 25 kiloton fission device has been fully weaponised and operationally deployed on (multiple) weapon platforms.” You will be forgiven for reading this article and believing that unless India has a 300kT or megaton thermonuclear bomb fitted on a 3500-km range missile, India’s nuclear deterrence capacity is not credible. But back in July 2007, you would have reached the opposite conclusion. “On the national security front,” Dr Santhanam then wrote in Mint “there are reasons to believe that India’s Minimum Credible Deterrent (MCD) would not be affected by turn-key power reactors built by other countries. The accumulated weapons-grade plutonium in about 40 years of operating the CIRUS reactor (40MWt) and the relatively new Dhruv reactor (100MWt) has been estimated to be sufficient for the MCD.” What he didn’t say then, and is saying now, is that yes, we have accumulated sufficient weapons-grade plutonium for minimum credible deterrence, but was half the story. The other half is that we need to build more powerful bombs, which requires more testing. Dr Santhanam’s 2007 intervention was in support of the India-US nuclear deal. His 2009 intervention is an initial salvo in the renewed domestic debate on India’s signing the comprehensive test-ban treaty (CTBT). His silence from May 1998 till this month was perhaps due to a combination of the official secrets act, loyalties, exigencies of service and regard for the national interest. Now, unless Dr Santhanam has another twist in the tale to be revealed at a later date, the fact that he admits that there are 25kT fission bombs “fully weaponised and operationally deployed on multiple weapon platforms” should end the debate on whether India’s deterrence is credible. As argued earlier, India’s strategic adversaries are unlikely to rest any easier knowing that their cities are threatened by mere 25kT fission bombs. They are, with India, in MUD. In a two part essay in the Indian Express, K Subrahmanyam explains the logic of India’s nuclear doctrine and why a minimum credible deterrence can be had without the need for a thermonuclear bomb. Developing, testing and deploying a thermonuclear bomb involves grand trade-offs. But those who are interested in ensuring that India’s deterrent capacity is robust should focus on an issue that is right in the backyard. Mr Subrahmanyam points out that “a continuity in respect of succession in both political and military commands” is the “most effective way of ensuring that the adversary will not succeed in his objective in carrying out such a decapitating strike.” Why is there no pressure on the UPA government to come clear on the lines of nuclear succession?